Please welcome Sarah Lotz back to the blog! 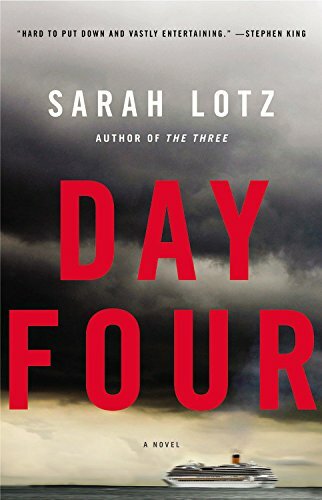 I loved Day Four, and am thrilled that she stopped by to answer a few of my questions about it! I loved The Three and can’t wait to read Day Four! What can we expect from the book? Will you give us a bit of a teaser? Day Four takes place on a cruise ship. What kind of research did you do for the book? Did you learn anything surprising from it? I read countless books, blogs and accounts written by ex cruise ship workers and spoke to a great deal of people who currently work or have worked on cruise ships. I think there’s a perception that working on cruise ships is a non-stop party and a great way to see the world, and this may be true for some, but many of the people I consulted – most of whom worked in the less glamorous jobs such as in the laundry or as stewards or waiting staff – often work grueling hours and are away from home for months at a time without a break. For the purposes of the book, I was mostly interested in the lower end of the cruise market – the huge companies that ferry thousands of people to Mexico and the Caribbean on shorter cruises. I went on one and it was a real eye-opener (and not always in a good way, as I get horribly seasick at the slightest movement and had to do a lot of research below the waterline). Life behind the crew-only doors on ships is a world away from the glittery facade passengers see, and some of it is grim. I also learned in detail what happens when a crime is committed on board, and what happens to your body if you die on a cruise (and no, they don’t throw you overboard). Is Day Four told in the same way as The Three, in witness statements, news accounts, etc? No, I wanted to do something different with Day Four. I loved writing The Three in that format, but I didn’t want to repeat the same thing. Is there a particular character that’s your favorite in this book? Yes: Althea Trazona, one of the cabin stewards on the VIP deck. On many of the cruise lines stewards and waiters depend predominantly on tips and good reports to make ends meet, and many are supporting entire families back home, so they have to be unflappable and courteous even when they’re having an appalling day or are ill. I wanted to explore how someone coped with this, and what goes on behind the cheerful mask she’s forced to wear in front of the passengers, especially the ones who treat her discourteously and are total assholes. I worked in the service industry for a while, and have never forgotten how exhausting it is to keep smiling when you’re feeling terrible or someone’s treating you like crap. It’s been a while since we’ve caught up… Have you read any good books lately? Is there anything you’re looking forward to this year? I think this year is going to be incredible for fiction – especially genre novels. I could give you an endless list, but here are a few current and forthcoming releases that I particularly enjoyed: The Night Clock by Paul Meloy (gloriously witty horror novel); The Death House by Sarah Pinborough (fantastic heart-wrenching crossover YA); The Long Way to a Small Angry Planet by Becky Chambers (awesome space opera) and Way Down Dark by JP Smythe (who might be the UK’s most underrated author – he’s incredible). I’m researching my next book at the moment so I’m reading a huge amount of non-fiction, but I’m also about to start Fred Strydom’s The Raft – I’ve heard great things about it. More writing, more reading, more research and hopefully lots of good coffee. The chilling follow-up to The Three, Sarah Lotz’s “hard to put down and vastly entertaining” debut (Stephen King). When, at last, the ship is spotted drifting off the coast of Key West, the world’s press reports it empty. But the gloomy headlines may be covering up an even more disturbing reality. Day Four, interview, sarah lotz.